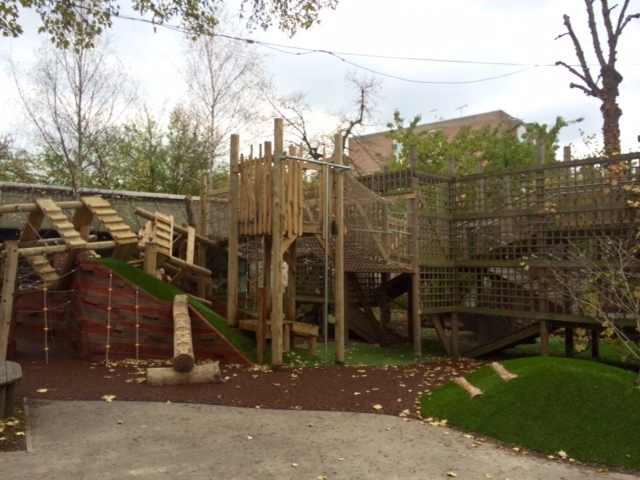 Camden’s exciting Active Spaces project has seen seven local schools benefit from the creation of innovative new outdoor playground structures. The schools were chosen on the basis of where there was the greatest need for pupils to increase their physical activity and where outdoor spaces were previously underutilised. Pupils and local communities were involved in the design process. Each schools design is unique and includes features such as timber balancing and climbing trails, trampolines, all-weather mini football pitches and ‘witch’s’ towers’, complete with slides. The spaces are being well-used by the children during term time and Jubilee Hall Trust has now agreed to provide some staff to enable them to be opened up outside of normal hours as well. The first pilot day was on Saturday 6th December at Torriano Junior School, when more than 20 families took advantage of the opening to come and play on the equipment. The Trust is planning to staff more trial weekends in the New Year at both Torriano and Argyle Primary schools and has applied for funding to enable the playgrounds to be opened up for longer periods in the school holidays in future. The scheme is a culmination of a strategic partnership, with the capital coming from the Camden Clinical Commissioning Group and Camden and Islington Public Health, whilst University College London is leading a research project to measure the impact on children’s activity levels, fitness and health.